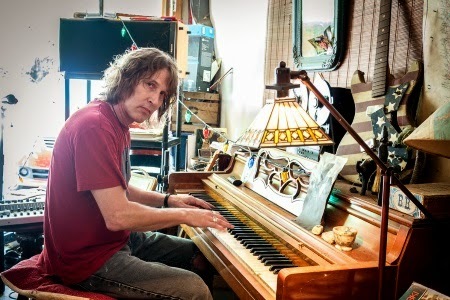 Singer and multi-instrumentalist David Corley has been around. He tended bars, lived off the land in a in Georgia, honed his roofing skills in Wesport, CT, hung out in NY and Venice Beach, CA, before coming full circle to live in Lafayette, Indiana, the city where he was born 53 years ago. Throughout his Jack of all trades life he always kept in touch with his love for music and literature (James Joyce, Walt Whitman, William Blake and Rainer Maria Rilke). The influence of these classic writers shines through in his lyrics, spinning metafores and a sense for keen observations wrapped in poetic language. His debut album Available Light is a scrapbook of his life set to music. Produced by Hugh Christopher Brown Corley sings about rural Indiana, staring at the night sky and making ends meet. His hoarse baritone voice fits the rootsy blues music like a glove. It's been a long trip but he has finally reached his goal: to be a singer who can share his stories with the world. There must plenty of other tales waiting to go out and join this first batch songs. Available Light is a self-released album. Buy it from his website. Update: Corley landed an European distribution deal via Continental Record Services.